Sleeping pills can't work when you forget to take them so I'm up again. It doesn't feel as bad as yesterday morning but that time change is always a bear. During my last library trip I picked up a few books instead of just cds. 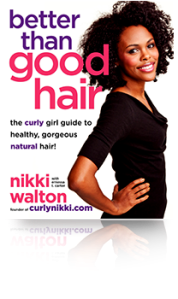 One of the books I was surprised to see was Better Than Good Hair by Nikki Walton or CurlyNikki as most of you know her as. It's a natural hair care book much like the website with tips, personal stories and just some general expectations of what it's like to be natural. I didn't grab it because I'm thinking of going natural AT ALL but I figured I would look it over and see if there's anything I could pick up. Insomnia fit gave me time to look over it and it's a great guide if you are thinking about going natural with a very nice introduction from Kim Wayans. If you are like me and have no desire to go natural you may not glean much from it. There are no direct product suggestions even though some oils and techniques are recommended. For the braid/cornrow challenged there are some picture guides that may help. I'll find out the next time I wash or co wash my hair cause I really can't braid my hair to save my life. It's full of good information for the natural contingent or those in transition. Much like the site though the book (at least from what I saw the last time I visited which admittedly was a while ago) isn't geared toward all hair types and could make those not on the natural path feel a little left out. Having said that I think it's a good addition to the hair care literature for African American women and even contains a section on working with kids and biracial/mutiracial kids and their hair. If you like CurlyNikki you'll love the book and stories therein and it's only 10 bucks right now on Amazon so good investment for what you are getting back definitely.